reduced amount of white matter in the brain. 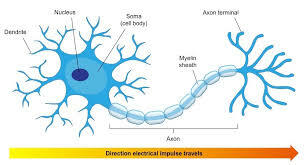 White matter is composed of the Axon bodies of the neurons (see diagram below) that connect the cell bodies of the neurons that make up the so-called grey matter. On account of the profound anomalies in brain structure associated with this syndrome, affected individuals present with severe and wide-ranging intellectual disabilities. These can include involuntary muscular movements, difficulties walking, sleep disturbances, seizures and general irritability. In addition, abilities in speech and language are often seriously impaired adversely affecting social interactions. The FOXG1 syndrome has been grouped as an autistic-like disorder. Although the range of impairments evident closely mirrors that of Rett syndrome, it is now classified as a distinct disease. In terms of the etiology the FOXG1 syndrome, it is believed to be caused by a mutation in the FOXG1 gene. The normal gene encodes for a the Forkhead Box G1 protein (see diagram below). 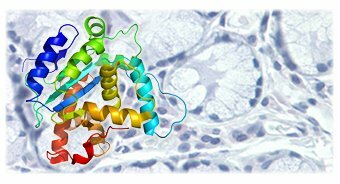 this protein seems to play an essential role in brain development where it functions as a transcription factor that normally represses the activity of certain genes when they are not required. Extensive research has demonstrated that the FOXG1 gene product is involved in the development of the brain in early embryonic life. The particular site of action of this transcription factor is the telencephalon that ultimately develops into the cerebrum that is involved in so many critical high-order functions in the human brain including language, sensory perception, learning and memory. Finally, Rett syndrome is also believed to be caused by a different mutation in the FOXG1 gene leading to a dysfunctional Forkhead Box G1 protein. Since the origin of these diseases are genetic in origin and impose their deleterious effects during embryonic development, a cure may ultimately reside in the introduction of the normal FOXG1 gene in utero. This may indeed become a reality at some future time.